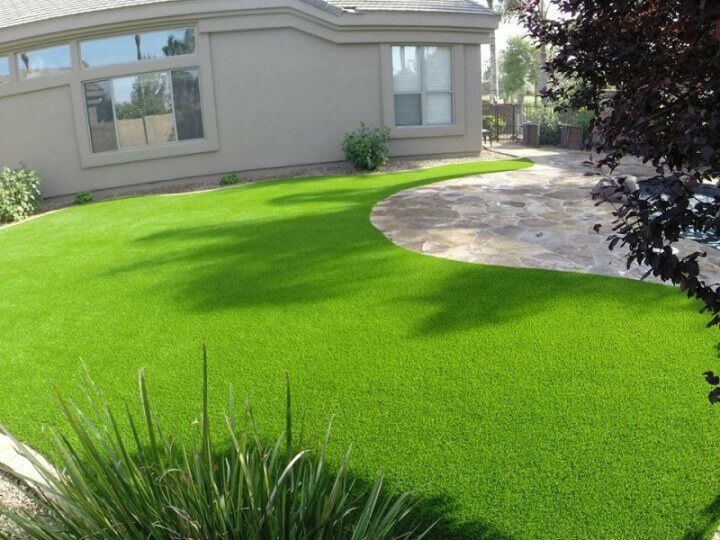 With the rising popularity of artificial grass as undeniable fact, many ask themselves if they should choose synthetic turf over natural grass. The two options have been contending for the winning spot in our hearts and lawns for a while. Artificial turf gets produced from polyethylene or polypropylene synthetics to make the grass-like fibres. One consisting of several layers can be more expensive, but include cushioning, backing, infill and drainage layers. Synthetic grass was originally intended for stadiums use in sports. Advancements in technology meant better quality artificial grass would be available for the general public. We’re going to take a look at why artificial grass works so well during the winter season and the pros and cons of each so you can decide what works best as well as the costs of each. There are many landscaping companies who offer both the installation of artificial or natural lawn. It demands little to no maintenance even in the colder months. Synthetic lawns are something you can put in and leave. Natural grass is going to need attention throughout the winter, so you might have time to really enjoy the holidays to the full. It’s okay to walk on throughout the winter. Synthetic grass isn’t going take harm from heavy play or prolonged frosts. Because this is a time of year where relatives and friends will be around, it’s nice to know it can be stepped on accidentally. Be wary when the temperatures fall below zero. Even though artificial grass experiences increased traction, it can get slippery in extreme cold. It cuts down on your carbon footprint. It catches some people off guard, but artificial grass is contributing to a healthy environment. It doesn’t need any fertilizer, water or mowing. Each one these uses resources and emits harmful elements at the same time. Why stick with natural lawn? Caring for your lawn can bring a feeling of pride. Artificial grass is definitely self-sustaining. Still, gardening and how enjoyable it can be to see your labour pay off is unmatched. The work you put towards sustaining your lawn naturally throughout the winter is immensely satisfying when spring comes. It stops flooding and soil erosion. Moderate and heavy rain isn’t uncommon throughout the winter months. This can sometimes cause flooding or soil erosion. Natural grass has a large role in hindering this as it can redirect the flow and allow the soil to absorb it instead. Artificial grass costs £54-£215 per square meter set into the ground. After getting artificial grass installed by a professional landscape gardening company, there are no additional expenses for 15-25 years afterwards. Sod, or professionally laid grass, on the other hand, is just £1.50-£6.50 per square meter. However, the expenditures (and upkeep) will only be getting started for natural grass owners.